Are you interested in making some change? Join the Diversity & Inclusion Team at our next committee meeting happening in one of two ways: At ArcStone or Online via Zoom*. Please contact the Director of Diversity & Inclusion if you plan to attend or have additional questions. At the beginning of each committee meeting, we introduce ourselves with our name, pronouns, and why we are in attendance. We quickly review our mission and charge, which we all had a hand in crafting, before moving on to any agenda items. While we welcome additional items for review, we will always cover our diversity and inclusion chapter initiatives which include: our #DoBetterMN campaign, accessibility to AIGA memberships, AIGA event audit reviews, and plans for our annual equity and inclusion all-member training. All are welcome to attend our committee meetings. Our meetings are on second Mondays. Terresa Moses is the Creative Director of Blackbird Revolt, a design studio which uses art and design to create conscious messaging and works with a number of organizations that are effecting social change. She is also an Assistant Professor of Graphic Design at the University of Minnesota Duluth’s Department of Art & Design. She graduated with her BFA in Fashion Design and minor in African-American Studies from the University of North Texas in 2008. After completing her BFA, she worked as a graphic apparel designer for over six years at a sports agency before going back to UNT to complete her MFA in Design Research with a minor in Anthropology in 2015. Her design research interests include; “Project Naptural” a project on Black natural hair and its effects on the self-identity of Black women, “Racism Untaught” a project to help integrate anti-racist concepts into design classrooms, empowering marginalized and underrepresented communities, and rewriting denigrating social narratives. 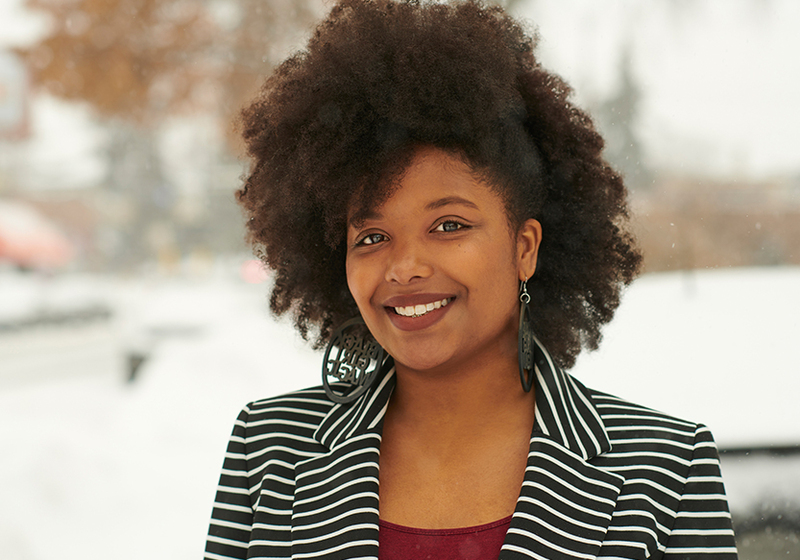 She serves as the Director of Diversity & Inclusion for AIGA Minnesota (the professional organization for design) and currently leads the committee on a campaign about privilege called Do Better Minnesota. She also serves on the executive board of the Duluth NAACP as the advisor for College Chapter at UMD and Young Adult Committee Chair. Lastly, she serves on the board of the Clayton Jackson McGhie Memorial Committee.